On Sunday March 26, 2017 DOCOMOMO Belgium and LAPIS. 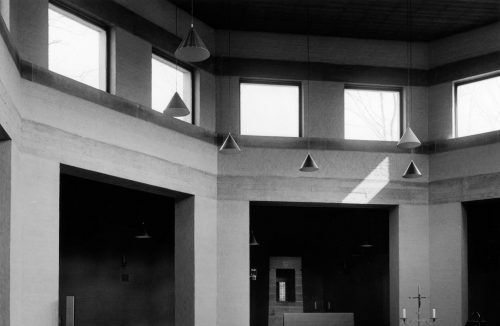 (Lemaire Alumni Platform & International Society) are organizing an exclusive visit of the Abbey of Roosenberg (1975) in Waasmunster by Dom Hans van der Laan (1904-1991). Guided tours will be mainly in English. With the promising plans of the KU Leuven to turn the Abbey of Roosenberg into a study center, LAPIS. has been given the opportunity to organize a visit through this extraordinary piece of architecture by Dom Hans van der Laan with a testimony from its closed community from the past 40 years (sisters of St. Francis) and a discussion on the potential of its future reuse. Join us at 09.00 am for the morning mass or later at 10.00 am for an introduction by LAPIS. members Barbara Van der Wee and Paul Lievevrouw. At 10.30 am, sister Trees and van der Laan expert Caroline Voet will guide us through the Abbey, followed by a small lunch and a walk through the nearby woods. As the tour is limited, we kindly ask you to subscribe a.s.a.p. here. 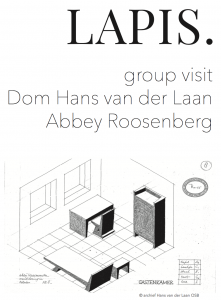 This group visit is a first joined operation between LAPIS and Docomomo Belgium, so special offers apply to members.